From a overgrown pea gravel filled yard to a low maintenance backyard oasis. The clients wanted no grass, a pond-less water feature and a small sitting area. Northshore with a copthorne accent created the patios and walkways. A underground pond kit, created a beautiful water feature for the birds to bath in. The seating area provides a nice spot to sit back and enjoy the sun. Sit back and Relax and Give us a Call. Before – A old deck and planting. After the Demolition of the existing deck and planting was done. The base was all dug out and prepared for the interlock. The footings for the posts as well as the concrete pad for the walls are installed. The Pergola top and frame were done after as well as the steps exiting the walkout. All the stonework at this point has been finished. 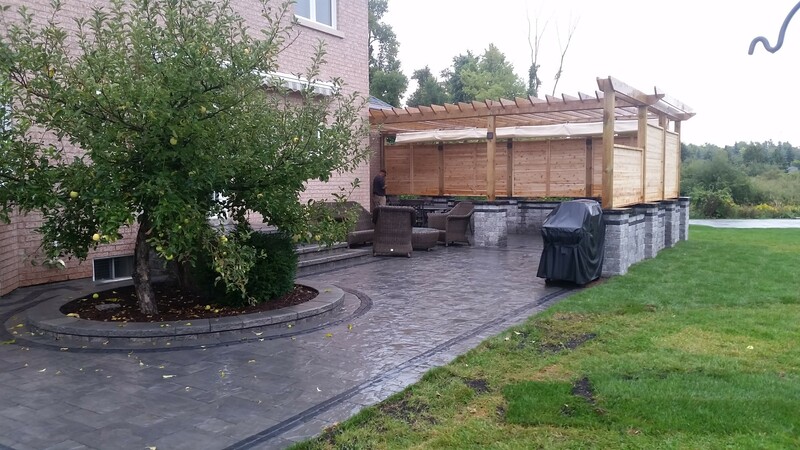 The Patio was installed with Thornbury – Almond Grove accented by Basalt Copthorne stone. The walls were created with Brussels Dimensional – Limestone with the Basalt Copthorne accent as well. The coping was Natural flagstone. Polymeric sand was swept in and watered to solidify. This Front Entrance originally had 6 stairs right at the front. 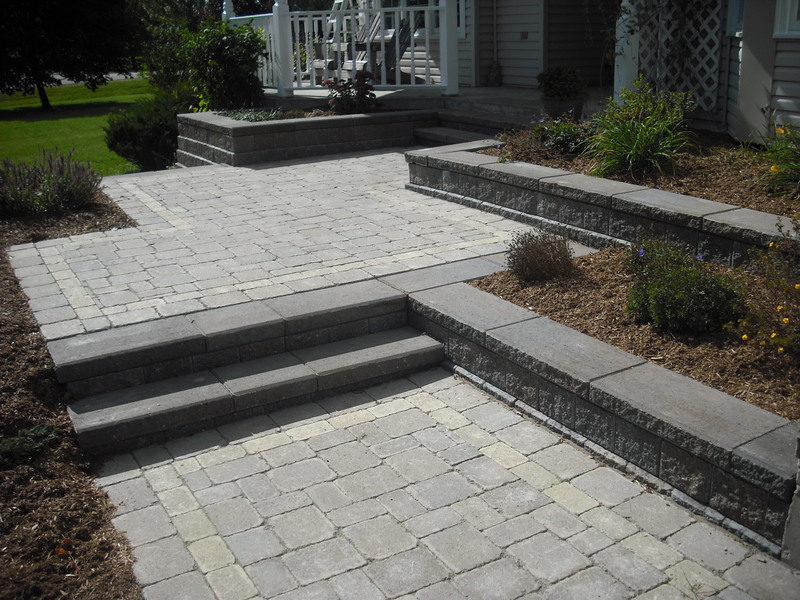 By creating various landings it created a nice curb appeal and made it a lot safer to get to the front door. This job consisted of re-routing the drain pipes, Creating planters, unilock pathways followed by planting and mulching. Pisa Granite was used for the walls. Brussel’s Block – Limestone with a Sandstone accent for the walkways.